The promotional slogan of Price Slicer is “Keep more money in your pocket with Price Slicer:” It sounds tempting, but it is nothing but a fantasy created by the program’s developers. In truth, the program will not do anything beneficial to the user. It is more likely that the program will do the opposite. 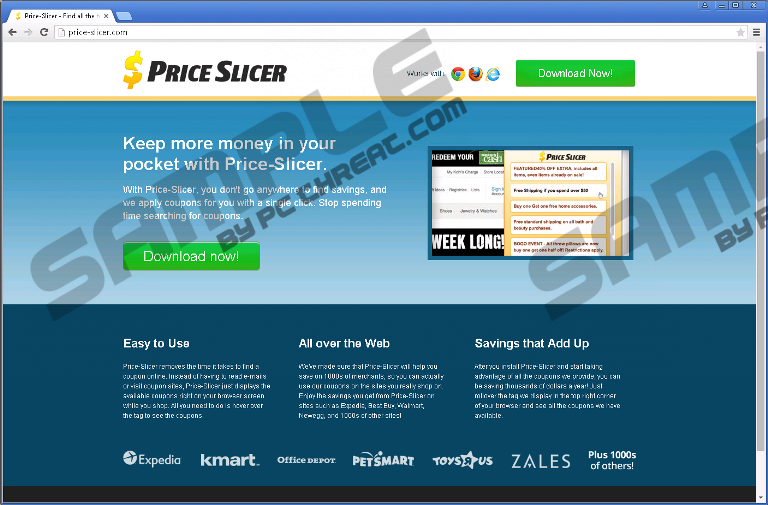 Price Slicer is an adware application that is likely to cause a lot of problems, so you should remove it whenever possible. By having this infection on your computer, you run the risk of getting it infected with malicious software, because the ads are supplied by unreliable third parties. Our researchers have recently analyzed adware applications called RopeInSavings and PriceChomper, which are identical to Price Slicer. Just as with its predecessors the developer of this adware remains unknown, but we should find some information regarding this in the future. It is no wonder that malicious applications cannot be traced back to their creators, because if that was the case, the developers would have a hard time finding work. Malware development is a dishonorable business, but many are tempted to get into it, because it is easy money. Indeed, adware applications such as Price Slicer use the pay-per-click system to generate revenue. So, the advertisements must be interesting and appealing to each user. Therefore, the developers use the application to gather information about the user, which is necessary to make adjustments to the marketing campaign. However, the developers claim that they do not collect personal information about the user, but in some cases personal information can be “accidentally” acquired. Price Slicer can collect search terms the users enter into a search engine. Names, addresses, and other personally identifiable information might end up in the wrong hands, such as the developers, or even worse – their partners. As far as non personal information is concerned, Price Slicer collects web log information, which may show which country and city you are located in. in addition to that it collects information, such as IP addresses, browser types, operating system, search providers, and so on. Personal information being collected and shared with unreliable third parties is very concerning, and it just goes to show whow the developers regard the users of their "product". Privacy is very important, so a security-minded person should not neglect it. For this reason, we recommend removing this application as soon as possible. Now let us discuss the advertisements themselves. As you already know, the ads are supplied by various advertisers whose origins are mostly unknown, and whose legitimacy cannot be verified. It is likely though not definitive that Price Slicer can promote infected websites that feature malicious software downloads. Needless to say that the consequences of your computer becoming infected with Trojans and similar malware will be severe. Therefore, we advise you to remove Price Slicer using the instructions provided at the end of the article or get an antimalware scanner that would do it for you. In any case, we recommend getting an antimalware scanner after removing Price Slicer manually to check if the PC is truly malware free. Locate Price Slicer and click the Remove button. Locate Price Slicer and click the Uninstall button. Click Search, type Uninstall a program, and click on it in the search results. Quick & tested solution for Price Slicer removal.